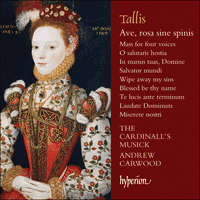 We are joined once again by Andrew Carwood of the Cardinall’s Musick with three more of his recent Tallis discs (including the Gramophone Magazine award winner). 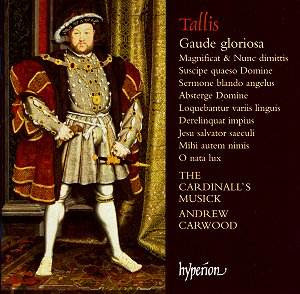 I. Tallis: Gaude Gloriosa (Hyperion CD CDA 67548). From MusicWeb.com: Listening to Tallis is, for me, like coming home or entering a sanctuary. Many excellent discs offer a good range of this glorious, uplifting music. Hyperion has now added another to the collection, with Andrew Carwood directing the outstanding Cardinal’s Musick. Tallis lived during a time of tremendous religious upheaval. The succession from Henry VIII to Edward VI, Edward to Mary Tudor and Mary to Elizabeth meant changes from Catholic to Protestant, and back again with Mary, before Elizabeth’s "third way" – a more accepting and moderate form of Protestantism. Tallis lived through all of this and, remarkably enough, managed to please each monarch in turn. Although very difficult to date accurately, the pieces on this disc are thought to cover the range from later on in Henry VIII’s reign (the Magnificat and Nunc Dimittis) to Elizabeth (Derelinquat impius). A number of the works featured here have been taken from the 1575 Cantiones Sacrae – a volume of Latin motets published by jointly by Tallis and Byrd and containing seventeen pieces by each composer. It is suggested that the total number of 34 pieces was to recognize the number of years that Elizabeth had ruled. The disc opens with the beautiful Jesu salvator saeculi, a hymn for use at Compline, which is followed by Gaude gloriosa, the most substantial work on the disc - a 6-voice votive antiphon. This hymn to the Virgin Mary is probably a later work recalling an earlier style as used by composers such as Fayrfax and Ludford. It is a highly accomplished and concise work despite its rather rambling text. It is very well structured and assured, and Carwood teases out the beautiful lines admirably. A hymn for use at Lauds follows - Sermone blando angelus, before a 5-part Magnificat and Nunc Dimittis, which typically alternate chant and polyphony but lack a cantus firmus. The peaceful Mihi autem nimis sets the antiphon of the introit for the Feast of the Apostles, and is followed by the striking Absterge domine. Derelinquat impius is thought to be one of Tallis’s last compositions on account of its unusual and innovative chord progressions and harmonies and is indeed a wonderful and exciting work. The motet for Pentecost, Loquebantur variis linguis ensues, a polyphonic responsory with the cantus firmus in the tenor part while the other 6 parts intertwine around it. The 7-voice Suscipe quaeso domine is an interesting piece in its highly personal and intense response to the text. It is speculated that the text could have been written for, and the piece performed at, the ceremony when the Archbishop of Canterbury under Mary, Cardinal Pole, absolved England from her division. The disc concludes with the brief but gorgeous motet O nata lux, which takes two verses from the hymn at Lauds on the Feast of Configuration. The Cardinall’s Musick – a group specialising in music of the English Renaissance – excel themselves here. The singing is radiant, warm and luminous with the individual winding strands of voices clear and concise. I heartily recommend this disc. II. Tallis: Ave, rosa sine spina (Hyperion CD CDA68076). From Andrew Carwood: The years between Henry VII’s triumph over Richard III on Bosworth Field in 1485 and the start of Henry VIII’s measures to break with Rome saw developments in English music which were unique in the Western world. The resulting political stability and Henry VII’s much tighter control of finance allowed England to grow into a country that became increasingly valued in terms of diplomacy and influence, and one which blossomed artistically. Sacred music began to be written on an ever-larger scale: longer, higher and, at its best, more dramatic than anything produced on the Continent. Music for the Church and its liturgies in this period was essentially divided into four types. Needed at main celebrations of the Eucharist were settings of the Ordinary texts (Gloria, Credo, Sanctus, Benedictus and Agnus Dei) and these were often based on a plainsong melody. For the more modest Lady Mass smaller-scale settings were required. For the Divine Offices, it was the service of Vespers which was most adorned with extended settings of its central canticle, the Magnificat. The fourth category is a more wide-ranging one—the Votive Antiphon: pieces which were added to the liturgy, often at the end of Mass or Vespers, and which expressed deep devotion to their subject through both the text and the music. The Virgin Mary was the most common subject, although as reforming ideas became more current texts and music began to appear in honour of Jesus Christ. The texts, a little like the pre-Reformed Church itself, grew in an effusive, rambling style, unpruned and unchecked. The best are clever and inspiring, like Fayrfax’s setting of Maria plena virtute; the worst are lengthy, clumsy and predictable in their rhyming scheme, sometimes using the suffix ‘-issima’—the ‘most’ (‘gloriosissima’—‘the most glorious’)—at the end of every line (as in the first three stanzas of Ave, Dei patris filia). Every composer working in this period who was worth his salt had to grapple with the difficulties of writing such Antiphons and Thomas Tallis (c1505–1585) was no different. We are still unsure as to the exact date of Tallis’ birth—no records have yet come to light—but so complete is his understanding of the pre-Reformation style that he must have been born in time fully to experience and assimilate it, hence placing him around 1505. The first official record we have describes him as organist of the very modest Benedictine Priory of Dover in 1532. By 1537 he had come to London and found employment at the church of St Mary-at-Hill in Billingsgate, but in 1538 he moved again, this time to the Augustinian Abbey at Waltham in Essex. This proved to be something of a mistake. Henry VIII’s systematic suppression of the monasteries began in earnest in 1536 (Dover Priory was an even earlier casualty in 1535) and ended in 1540 when Waltham Abbey was the last to be dissolved. Tallis found himself with neither job nor pension but quickly re-surfaced as a singing man in the choir of Canterbury Cathedral. In 1544, Tallis’ name is found on the lay subsidy roll for the sovereign’s private chapel, the Chapel Royal, and he must have returned to London sometime after 1542. Tallis married his wife, Joan, in or around 1552 and in 1557 was granted a twenty-one-year joint lease on a manor in Minster near Thanet in Kent by Queen Mary. In 1572 Tallis and his younger colleague William Byrd (1539/40–1623) petitioned Queen Elizabeth I for financial assistance and she responded by granting them a twenty-one-year monopoly on the printing and publishing of music. The Cantiones sacraeof 1575 was their only foray into the commercial world of publishing. Today it is appreciated as a fine collection of motets but at the time it quickly proved a financial disaster and led to a further petition for funds from the Queen in 1577. Tallis’ connection with the Chapel Royal remained throughout his life and he undoubtedly would have filled a variety of roles as composer, teacher, organist and singer. He died around 20 November 1585 and was buried in the Church of St Alphege in Greenwich. This prayer shewe[d] oure ladye to a devoute persone sayenge that this golden prayer is the most sweetest et acceptabeleste to me in her aperynge she hadde this salutacyon et prayer wryten with letters of golde on her breste. The music of Ave, rosa sine spinis is a considerable advance on that found in the four-part Latin Magnificat but it is not as sophisticated as Salve intemerata virgo. It is hard to place Tallis’ works in a chronological order but of those left to us perhaps this is the second or third most youthful. We can with certainty say that it must belong to the period before his return to London as a member of the Chapel Royal in the mid-1540s. Tallis has learned his craft well, having a judicious mixture of sections for solo voices set against full-choir writing and an easy, fluent way with melody. Harmonically it is rather conservative, nearly always cadencing in D minor, but he does venture further abroad in the last section, visiting both the sub-dominant and dominant in the space of ten bars. There is also a fine closing Amen which features an imitative melody reminiscent of the final section of Gaude gloriosa (his final word in the Antiphon tradition). dating from the same period is the little Euge caeli porta, a setting of the second verse of Ave, praeclara maris stella—a Sequence to be sung during Lady Mass on Sundays. Found in the Gyffard Partbooks, it is a modest, four-part piece which contains a decorated version of the plainsong in its lowest voice. The Reformation movement throughout Europe was not a sudden event, nor was it confined to political and ecclesiastical legislation. Discussions had been taking place hand-in-hand with the rise of humanism for some years before Henry set to work in earnest, and some liturgical and musical experiments can be seen during his reign. Tallis’ Mass for four voices is an interesting example of this process. The Mass is in Latin, but compared with earlier settings of the Ordinary (Nicholas Ludford’s Missa Videte miraculum, for example) the style is radically different. The composition is shorter in length and the Gloria and Credo are rigorously syllabic throughout. Gone are the meandering melismas and the clarity of the text is now paramount. Only in the Sanctus, Benedictus and Agnus Dei does Tallis allow himself a little more freedom. Gone also is the high treble voice which had been such a feature of music in the previous generation. Tallis does use a head-motif (with variations), but a new and unusual feature is the repetition of several sections from the Gloria in other movements: the music for ‘Deus Pater omnipotens’ reappears in the second Agnus Dei; ‘Domine Fili unigenite’ is used at the ‘in nomine’ of the Benedictus; ‘Domine Deus, Agnus Dei’ is the same as ‘Et incarnatus est’ in the Creed; and ‘Quoniam tu solus sanctus’ is the ‘Pleni sunt caeli’ from the Sanctus. The source for this Mass is the Gyffard Partbooks. Tallis seems not to have been much taken with the increased popularity of polyphonic settings of words from the Book of Psalms. He produced only two such pieces—Domine, quis habitabit? (the most popular text) and the one recorded here Laudate Dominum, a setting of Psalm 117. Lively, full of sprung rhythms and with some fine characteristic Tallis cadences, it may well have been the inspiration for William Byrd’s later setting of Laudate pueri. O salutaris hostia sets a text used during Benediction and has a pre-Reformation scoring of SATBarB. Its style however firmly places it during the reigns of Mary or Elizabeth I and it exists in a number of printed sources. The other five Latin motets recorded here are all taken from the Cantiones sacrae of 1575, the publication which Tallis undertook jointly with his friend William Byrd. The exquisite canonic Miserere nostri uses the same scoring as the Missa Puer natus est nobis and Suscipe quaeso Domine (which might imply it was written with Philip II’s Chapel Royal in mind) and it follows a tradition found on the Continent of complex canonic writing. The two highest voices are in canon at the unison separated by just one beat. Four other voices are involved in this technical tour de force. The discantus and contra tenor parts have the same music at the same pitch but the notes in the contra tenor part are four times longer. The two bassus parts are also in canon at the unison with the discantus part but ‘per Arsin et Thesin’ which means that for every upward interval in the tenor part, the basses have a downward interval and vice versa. In bassus I the notes are eight times longer than in the discantus part, and in bassus II the note values are doubled. There is one free voice! Salvator mundi uses a much simpler canon at the lower octave between the superius and tenor. This is the second of two settings of this text by Tallis. Three pieces are associated with the Office of Compline: the beautiful respond In manus tuas, Domine and two subtly different versions of the hymn Te lucis ante terminum, one based on the Festal plainsong melody and the other on the Ferial. Two simple Psalm-settings are included from the collection of Tunes published alongside Archbishop Matthew Parker’s 1567 translation of the Psalter into English metrical verse. The publisher (or Tallis himself) provided a rubric, informing us that the melody for these Tunes is found in the tenor part and that if there is a choir present, then the harmonies may be used. To give a flavour of what Parker and Tallis were trying to create, the first verse is here sung by a baritone solo and subsequent verses by the choir: a concluding prayer (provided by Parker) is also chanted. In the publication each Psalm is preceded by a short tag or ‘Argument’ which provides a headline meditation on what is to follow. Tallis’ third tune is set to Psalm 2 Why fum’th in fight and was made famous by Ralph Vaughan Williams in his Fantasia on a theme by Thomas Tallis (1910). Should rage against him thus. The fourth tune is used for Psalm 95 O come in one to praise the Lord. In this Psalm Tallis—or his printer—has allowed a misprint into the edition, using the word ‘health’ at the end of both the first and second lines: Parker’s metrical text clearly uses ‘wealth’ for the first and ‘health’ for the second and this has been restored. His words to heare as we be bound. The remaining three pieces are contrafacta, that is, motets where the original Latin has been translated into English, either for private devotion in the home, or perhaps to allow performance of a fine piece of music in an Anglican church or cathedral where motets in Latin would not have been acceptable. We have used John Barnard’s The First Booke of Selected Church Musick (London, 1641) as the source for these pieces. When Jesus went into Simon the Pharisee’s house is an English-texted version of the second Salvator mundi (heard earlier in this recording) with a rather less elegant text than its original. More pleasing is Blessed be thy name which started life as Mihi autem nimis, but the most successful is undoubtedly Wipe away my sins, a version of Absterge Domine. This is such a fine piece that it would be hard to take away from its greatness even with a poor text but the English version is subtle and clever, often preserving the rhythm and word stresses of the Latin original. Contrafacta like these were important because they ensured that several Latin gems by Tallis remained in the repertoire of the working liturgical institutions of this country and his genius remained untarnished until the re-evaluation of his work in the twentieth century. III. 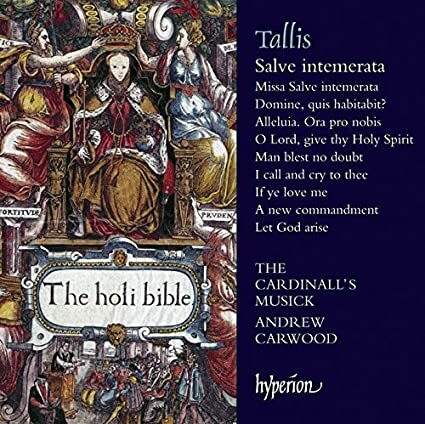 Tallis: Salve intemerata (Hyperion CD CDA 67994). From Andrew Carwood: When Robert Bolt wrote his 1960 play on the life of Thomas More (1478–1535), he chose a telling contemporary phrase for its title—A Man for All Seasons. Robert Whittington (c1480–1553) penned the description, explaining that More had no equal in ‘learning’ and ‘gentleness’ and could be ‘full of mirth’ or of ‘sad gravity’ depending on what was required at the time. More’s struggle to reconcile his own personal beliefs with the reforms of Henry VIII which led ultimately to his execution in 1535 is well known. Recent research has changed our view of the statesman-martyr and the appropriateness of the epithet but there is another man who deserves the accolade. Thomas Tallis (c1505–1585) lived and worked through the reigns of four radically different and difficult monarchs, all of whom forced their own religious beliefs on an increasingly confused and divided country. Their various attitudes to the religious questions of the day meant that each required different liturgies and different music to adorn them. Henry VIII (1509–1547) inherited and encouraged a tradition of grand, lengthy music, with soaring lines which amplified, extended and enhanced the text to be sung. Yet, as he began the process of the English Reformation, and as composers became influenced by the more succinct style of their colleagues on the Continent, this style had to change. Pieces became shorter and more syllabic—a process encouraged by Archbishop Cranmer who believed that each syllable should have no more than one note. Under the boy-king Edward VI (1547–1553) and his Protestant advisors music was even more restricted, with the once famous high treble part (commented upon by Erasmus) removed and Latin texts abandoned. For Mary (1553–1558), determined to restore Catholicism to England, composers returned to the Latin language and wrote more substantial pieces, dividing the voices so as to produce pieces in six or seven parts rather than the more severe four-part writing of the Edwardine years. For the astute Elizabeth (1558–1603), the style changed yet again: Latin could still be used but the length of pieces again became more modest. The fact that Tallis produced excellent music in all of these styles is a tribute to his talent, to his patience and to his diplomatic skill, or at least to his devotion to his employers. We cannot be sure of his date of birth—no records have yet come to light—but so complete is his understanding of the pre-Reformation style that he must have been born in time fully to experience and assimilate it. He produced Votive Antiphons, at least one Mass and a Magnificat setting which would not have been acceptable to Edward VI and would not have been à la mode for Queen Mary. Only Henry’s more Catholic regime would have required such pieces. The ‘best guess’ therefore is that Tallis was born around 1505, so that by the time we first hear of him as the organist of the very modest Benedictine Priory of Dover in 1532, he was about twenty-seven, old enough to compose with confidence and producing music for a rite which did not begin to change substantially until the mid-1530s. By 1537 he had come to London and found employment at the church of St Mary-at-Hill in Billingsgate, but in 1538 he moved again, this time to the Augustinian Abbey at Waltham in Essex. This proved to be something of a mistake. Henry’s systematic suppression of the monasteries began in earnest in 1536 (Dover Priory was an even earlier casualty in 1535) and ended in 1540 when Waltham Abbey was the last to be dissolved. Tallis found himself with neither job nor pension but quickly re-surfaced singing in the choir of Canterbury Cathedral, once a Benedictine institution but recently re-founded as a secular Cathedral. In 1544, Tallis’ name is found on the lay subsidy roll for the sovereign’s private chapel, the Chapel Royal, and he must have returned to London sometime after 1542. Tallis married his wife, Joan, in or around 1552 and in 1557 was granted a twenty-one-year joint lease on a manor in Minster near Thanet in Kent by Queen Mary. In 1572 Tallis and his younger colleague William Byrd (1539/40–1623) petitioned Queen Elizabeth I for financial assistance and she responded by granting them a twenty-one-year monopoly on the printing and publishing of music. The Cantiones sacrae of 1575 was their only foray into the commercial world of publishing. Today it is appreciated as a fine collection of motets but at the time it quickly proved a financial disaster and led to a further petition for funds from the Queen in 1577. Tallis’ connection with the Chapel Royal remained throughout his life and he undoubtedly would have filled a variety of roles as composer, teacher, organist and singer. He died around 20 November 1585 and was buried in the Church of St Alphege in Greenwich. The Votive Antiphon Salve intemerata virgo is an extended piece in honour of the Virgin Mary. Two regimes in Tallis’ lifetime required such pieces—Henry VIII’s pre-Reformation years and Mary’s restored Catholic rite. Its length and style combined with the rambling, rather complicated text clearly point to a piece for Henry. The antiphon is a great achievement with many fine and impressive moments and it is a great improvement on a rather jejune Latin four-voice Magnificat which probably pre-dates it. The earliest manuscript for the Antiphon is a single partbook dating from the late 1520s when Tallis would have been in his early twenties. He has obviously assimilated the work of Robert Fayrfax and others who excelled in the pre-Reformation style. The piece is in two main sections (the first in a triple metre and the second in a duple) and involves an alternation of sections for solo voices set against dramatic contributions from the full choir. It also includes an excellent final Amen section with a strong rhythmic impetus and a crescendo of imitation driving the listener to the final cadence. Tallis’ decision to write a Missa Salve intemerata based on themes from the Antiphon points to yet another development in English music history. Unlike on the Continent, it had been more usual for English Masses to be based on plainsong tunes rather than on polyphonic compositions. Robert Fayrfax’s Missa O bone Jesu is probably the first to break the mould, followed by John Taverner’s Missa Mater Christi sanctissima and Missa Sancti Wilhelmi devotio. It is likely that the Missa Salve intemerata is later than the Antiphon. Tallis seems more in control of the music, although this may be a result of not having to wrestle with the rambling devotional text. He picks the best moments of the Antiphon to quote in the Mass and provides new and more succinct material when needed, especially in the Benedictus and the Agnus Dei. The Mass sounds more modern with its syllabic style, yet Tallis keeps the old English pre-Reformation conventions: there is no setting of the Kyrie, the Credo text is truncated and each movement begins with a head motif (the opening melodies of the Antiphon). Also from this early period is the short Alleluia. Ora pro nobis for four voices. There is clearly a melody in the medius or alto part which means it can be identified as a liturgical text to be sung at Lady Mass (a daily celebration of the Eucharist which used texts relating to the Virgin Mary) on Tuesdays from Pentecost to Advent. The addition of a plainsong opening, or incipit, and the verse ‘Ora pro nobis’ allows a complete performance. The three short pieces in English—If ye love me, A new commandment and the exquisite O Lord, give thy Holy Spirit—show Tallis writing for the reformed rites of Edward VI and Elizabeth (who reinstated Edward’s First Prayer Book of 1549 when she came to the throne). The first two are examples of anthems which either use the word ‘commandment’ or refer to how one should live a godly life. This was especially important for Edward VI’s time when these anthems can be seen to reinforce the exhortation to godly living which was now explicit as a result of the Bible being read in English and a greater emphasis on preaching and teaching. Gone are the great soaring lines of the pre-Reformation where, from time to time, it was difficult to hear which word the choir was singing. Gone also is the impressive English treble voice. Instead Tallis produces beautiful four-part miniatures in two sections with the second section repeated in an ABB structure. O Lord, give thy Holy Spirit, a setting of a prayer published in 1566, obviously dates from the time of Elizabeth I. As the Votive Antiphon gradually went out of favour, composers and liturgists began to look around for other texts to set. The Book of Psalms (already being used by composers on the Continent) provided words to suit a variety of moods, and Psalm-motets started to appear during the 1540s. One text proved more popular than most, Psalm 15 or Domine, quis habitabit?. Not only Tallis, but also John Sheppard, Robert Parsons, Robert White (three times), William Mundy and William Byrd also set this text which, a little like the ‘commandment anthems’, gives information about how to live a godly life. Tallis’ setting is chaste and serious and clearly shows the influence of his Flemish contemporaries—only occasionally does he allow himself the luxury of some typically rich cadences. Elizabeth’s first Archbishop of Canterbury was Matthew Parker, a former chaplain to the Queen’s mother Anne Boleyn. In 1567, he published his own translation of the Psalter into English metrical verse and at the back of the publication are nine ‘Tunes’ written by Tallis to allow the Psalms to be sung rather than said. Tallis’ Psalm Tunes are all in the same metre, so if the people wished to sing all of the Psalms, they would have to use other melodies to fit the wider variety of metres used by Parker. Each Psalm (strictly speaking, Tallis sets eight Psalms, plus the Ordinal Veni creator) is preceded by a short tag or ‘argument’ which provides a headline meditation on what is to follow, and each is concluded with a Collect or prayer. The publisher (or Tallis himself) provided a rubric, stating that the melody is found in the tenor part and that if there is a choir present, then the harmonies may be used. To give a flavour of what Parker and Tallis were trying to achieve, these nine ‘Tunes’ will be recorded over several albums in this series and three verses of each psalm will be sung together with the doxology. The first verse is sung by a baritone solo and the concluding prayer is also chanted. their endes both glad & sad. So Christen man; as Christ his foes: may pray the same in sprite. The five-part English piece I call and cry to thee is the same music as the Latin motet O sacrum convivium published in the 1575 Cantiones sacrae. This habit of giving English words to Latin-texted pieces, known as contrafactum, was not uncommon during this period and may express a desire to sing music in the vernacular. It is thought that I call and cry may have started life as an instrumental fantasia, perhaps dating from the 1560s, but was revised and given its Latin title for inclusion in the 1575 publication. It is an exquisite piece, full of glorious imitation, based on syllabic writing and in an ABB form. It is beautiful in either language and is a good example of the fusion created by Tallis between the strict and controlled music of the Reformers and the more free, expansive writing of Mary’s restored Catholic rite. Thomas Tallis (c1505–1585), William Byrd (1539/40–1623). CD CDA 67548, CD CDA68076, CD CDA 67994.